Freshwater ecosystems in the Murray-Darling Basin have high levels of biodiversity and are likely to come under threat from projected climate change due to increased drying and warmer temperatures. Identifying habitat refuges that are likely to be more resilient to climate change will enable more informed prioritisation for environmental protection and environmental watering schemes. With this in mind, and as part of a wider project to identify climate refuges in partnership with WBM BMT for the MDBA, Institute researchers have mapped the relative spatial variability of five climate change components (temperature extremes, climate stability, climate isolation, rate of projected climate change, and climate heterogeneity). With many data inputs, including daily climate data over a 40 year period, the researchers have produced a climate refuge index map for the entire Murray-Darling Basin at a spatial resolution of about 30m, containing more than two billion pixels. The map identifies locations in the Murray-Darling Basin with the environmental characteristics that will more likely offer opportunity for resident species persistence in a warming climate. 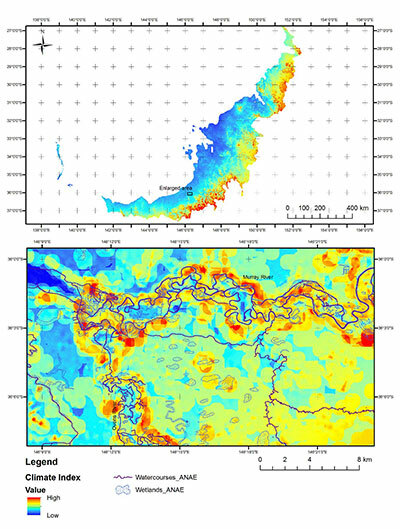 Image : Climate Index map for the Southern Temperate region (one of five climate regions of the MDB used within the study) , and an enlarged section taking along a length of the Murray River and its confluence with the Ovens River and eastern Lake Mulwala. Color scales indicating Climate Refuge Index are relative to both charts. A report has been prepared and presented to the Murray-Darling Basin Authority. With the knowledge of the locations of where endemic organisms are more likely to persist in a warming climate, environmental managers now have a tool to help evaluate possible conservation areas in terms of their potential to act as climate refuges.